The Eterna LEDRCF10 10 Watt LED Inspection Light is ideal for garages, workshops and other commercial applications. 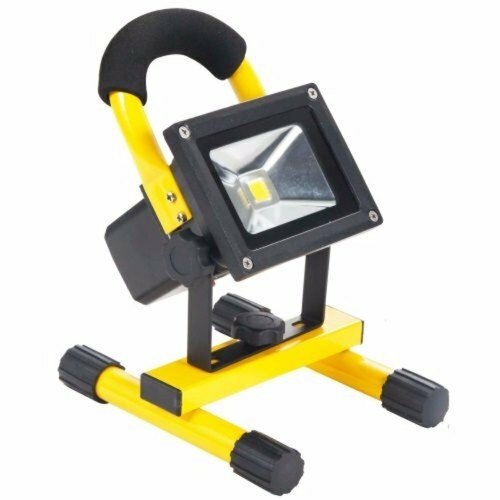 A fully rechargeable portable floodlight, produces bright daylight white light equal to 100W halogen whilst the fitting remains cool to the touch. Rated IP65 making this torch resistant to Water and Dirt and suitable for Outdoor Use. Floodlight tilts up and down on stand and has a 360 Degree rotation allowing the light to be directed at different angles. Powerful, lightweight and compact unit with dimensions: 250mm(Height) x 150mm(Width) x 165mm(Depth). The units battery gives up to 4 hours on 100% output or 6 hours on 60% output (switch has 3 settings). Comes complete with mains charger and car charger, charging time takes about 5 hours. Some other products which go perfectly with this Flood Light: C.K LED 8 LED Inspection Light or the C.K 200 Lumen Head Torch. Bought this for my grandson for his birthday as he likes to work on his car late at night. Put one of these in the woman's car for breakdowns, she broke down last week and the battery still hard charge to help her.. thanks electrical europe! Electrical World Replies: Yes this would be perfect for you. You can set it down in all conditions and work hands free. When we first got these in, some of the guy's here took one home to test them before we started selling them and they are definitely an impressive little light which lasts ages on one charge!